As 2014 comes to a close, I want to honor my guests, my All Star Authors who appeared on SlingWords in 2014 -- either with a Guest Post, a Dirty Dozen Interview, or a Thursday3Some Book Spotlight. 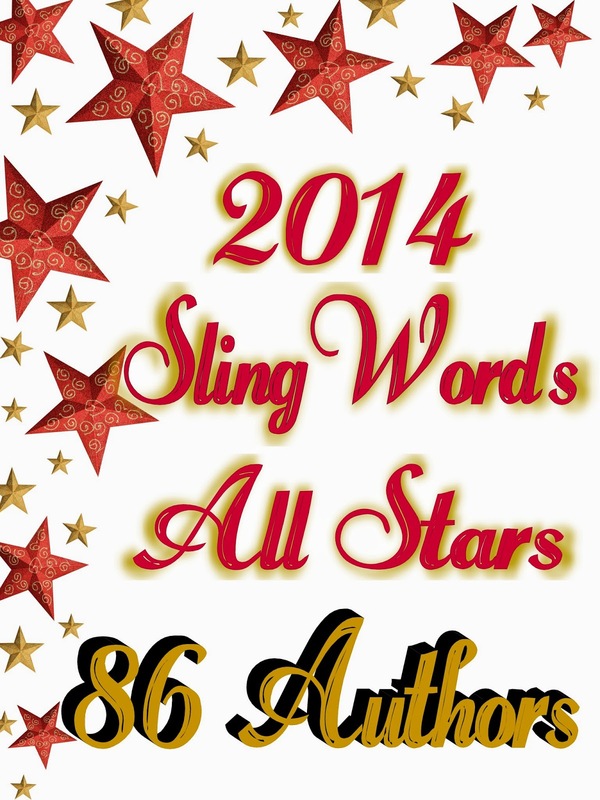 In 2014, I had the privilege of welcoming NOT 78 as the title of this post says, BUT 86 authors to SlingWords. (What can I say? It's late. I'm number challenged.) A few of these authors -- real go-getters -- appeared multiple times. After you read this post and scroll through the list of authors, go straight to Comments for a special treat. I've invited all these authors to leave a comment with a book that they'd like to recommend to you -- because it's free or discounted, a new release, or a book that's proved popular with readers. You'll see the author's name, book title, a 1 sentence blurb, and 1 buy link posted by some of these All Star Authors -- just in case you're interested in grabbing one last book for 2014 to go with your glass of bubbly. Alphabetized by first name because that was the easiest word processing sort, and I'm all about easy. SlingWords is a labor of love for me. Yes, it's usually a lot of work, but I love being able to share what I'm reading, watching, or writing. Also, I love introducing new authors and books to the reading world which comprises most of the readership for this blog. So look for more of all of the above in 2015. Happiest of New Year's to you! Authors, please post your special book for readers along with a small cover image, a 1 sentence blurb, and 1 buy link. Happy New Year to my favorite people: authors and readers! Oops! I see a cover image can't be posted easily unless you have a link to where the image is hosted on the web. Sorry. I didn't check into this earlier. Okay, title, blurb, link. Go for it! Thanks fo rhaving me, Joan, and Happy new Year to you! My pleasure, Helena. May all your dreams come true in 2015! Thanks, Joan, and Happy New Year! You're welcome, Liz! May all your dreams come true in 2015! On his way home from a cattle drive Jesse Mason finds a woman, who has been shot, and an infant. What are they doing out in the middle of the Kansas plains, miles from any town, and who wants them dead? Thanks Joan. Here's to 2015 and another year of Sling Words! You're welcome, Penny. May all your dreams come true in 2015! To Joan and all her fans, Happy New Year. And a Happy New Year to you too, Susan! My pleasure, Linda. May all your dreams come true in 2015! You're welcome! May all your dreams come true in 2015! You're welcome, Mickie. Happy New Year! Cathy Perkins, author of CYPHER: When a hit man kills the wrong person, a SC detective confronts hidden agendas & conflicting motives in a powerful local family, while trying to control his attraction to the intended victim—a woman who's hell-bent on saving the remnants of her family. You're welcome, and Happy New Year to you too, Cathy. Hi Joan - Thanks so much for doing this! My O'Leary series - contemporary romances set in Chicago around a large Irish-American family are on sale through today $1.99 - $3.99 for the first 4 books. Hey, Shannyn. Happy to have a party. Happy New Year. On the eve of the biggest art event at Huckleberry Mountain Resort, potter Shandra Higheagle finds herself in the middle of a murder investigation. Special Pre-order price of $.99! You're welcome, Paty. Happy New Year. Thanks, Joan , for posting this, but also for being an inspiration of to so many of us, not just in your writing, but as a professional in this big marketplace. I'm thrilled and honored to call you a fellow Author of Main Street. I love writing my sweet westerns and my edgier River City Novels. HAPPY HOLIDAYS, RIVER CITY isn't about Christmas - it's about finding love, blending traditions, hope for the future, and hearts really don't care which holidays people celebrate. Juli D. Revezzo author of Changeling's Crown: A fairy tale romance. You're welcome, Juli. Happy New Year. Thanks for putting together this wonderful post and for coordinating all of us! You rock, Joan! Why thank you, Mina. Have a wonderful 2015. Thanks, Veronica. Happy New Year. Thanks so much, Joan! Happy New Year! You're welcome, Liv, and Happy New Year to you. Thanks, Annette, and Happy New Year to you. Thanks, Jen. Happy New Year to you too. You're welcome, Susan. Happy 2015. Hey, Sheila. Happy 2015 to you. Joan, you amaze me with the way you share with fellow authors. Real Vampires Say Read My Hips is my new release this month, http://amzn.to/1tnQd3p/ Can Glory finally make it to the altar? Not if her mother has her way. Happy new year! Gerry, we go way back, don't we? Wishing you great success in 2015. L.A. Sartor, thank you Joan, lovely to be a guest of yours. You rock with your Slingwords! Forever Yours This New Year's Night (perfect for right now :) is my latest release is a best seller on Amazon; "They have one week to complete their assignment, one week to trust each other, one week to fall in love." http://amzn.to/1e10fkd. You're welcome. I enjoyed being your guest too on An Indie Adventure. Happy New Year. Thanks so much, Joan, for having me and the other authors during 2014. Happy New Year to you and yours! My pleasure, Barb. Wishing you great joy in 2015. Thanks Joan and Happy New Year Everyone! Circles of Fate is my NEW RELEASE! .... Fate brings together a cast of characters whose lives will forever be entwined. http://amzn.to/13b6qCG Ebook is 1/2 price when you purchase the print version! Enjoy ... God Bless! Thanks for doing this, Joan. You've helped so many! Hello, Susan. It was my pleasure. Happy New Year. I love coming on Joan's blog. Wish I got here more often. I had a personal assistant who scheduled me a blog tour in early 2014, and I swore off blogs for a while after that. Took me a month to write all the original content--a month away from my books. Speaking of books, I have a sale on right now for my Christmas Brides:3 Regency Novellas for $.99 everywhere. Thanks, Joan! Hey, Cheryl, have a Happy New Year! Thanks so much for having me on your fabulous blog, Joan. It's always an honor! My latest release is Claiming Annie's Heart, which is set in my favorite place--Ireland. Available for Kindle http://amzn.com/B00O6BOEPQ and at all other eBook retailers. The pleasure is all mine, Judythe. Have a wonderful New Year. FOLLOWING HIS HEART is available for Kindle, Nook, Kobo, and iBook. Thanks Joan! You're the best! I'm Kathryn Jane, author of The Intrepid Women Series.